I know some say the thing to do is eat your main meal at lunchtime, and occasionally I do. But mostly a hearty meal in the middle of the working day would have me snoozing over the keyboard by 2.30pm. Even when we’re out and about mostly I fancy something lighter at lunch rather than a full-on three courser. Tapas/petisco/mezes type dishes also work for me, but there are times when I just get the yen to wrap my chops around something hot in bread. There are countries where finding something with a local flavour (no international fast food franchises allowed) to satisfy this yen can be problematic. Portugal isn’t one of them. The more I get to know the country, the more tasty hot sandwiches/rolls I discover. Here’s the tally so far. I discovered this belly-busting sandwich on our first night of our first trip to Portugal and have been hooked ever since. 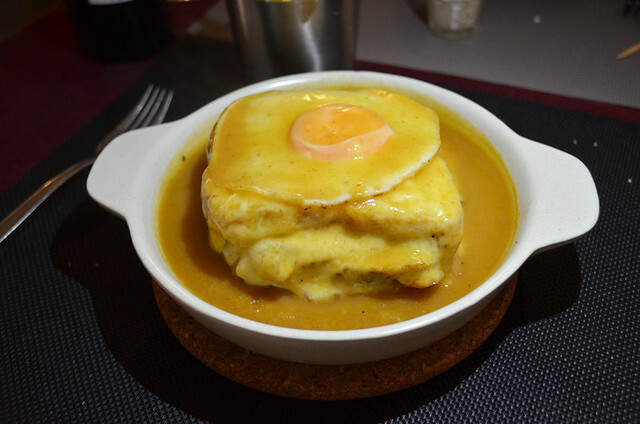 The francesinha isn’t a conventional sandwich in that it comes covered in cheese and surrounded by a spicy beer/tomato sea. So not something that’s advisable to pick up to eat. The filling can include bacon, ham, sausage, steak and/or pork fillet. 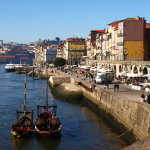 Although it’s a Porto speciality you can find them all over Portugal. I even managed to track down a restaurant selling them in the resort land of Albufeira in the Algarve. 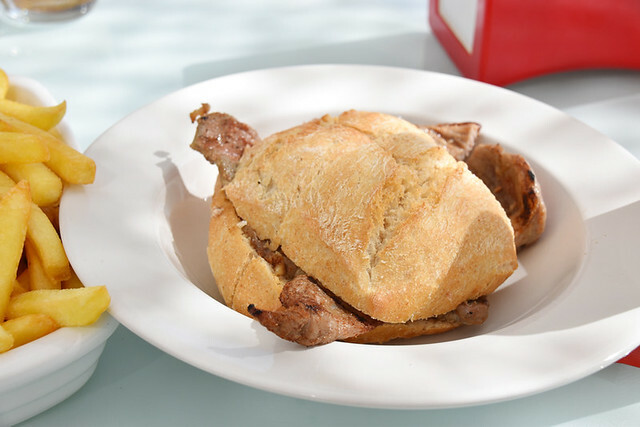 Prego is one of the classic Portuguese hot snacks, consisting of a seasoned steak fillet in a roll. A woman in Lisbon’s tourist office recommended we try one, so we did. There’s nothing particularly different about the prego, but it’s tasty, savoury and hits just the right spot when something hot in a bun takes the fancy. Another one you can find all across Portugal. This is a more robust version of the fillet of fish served in Maccie Ds. We spotted it on a menu in a cafe on a side street leading from Lisbon’s Rua Augusta (not an area we now eat in as it’s on the main tourist drag so prices can be higher and quality lower). It was cheap and we enjoyed it more than we expected. The Portuguese name for it seems to be a case of say what you see – sanduíche de peixe. In some cafes piles of these fishy rolls are pre-made and displayed in stacks in the window. 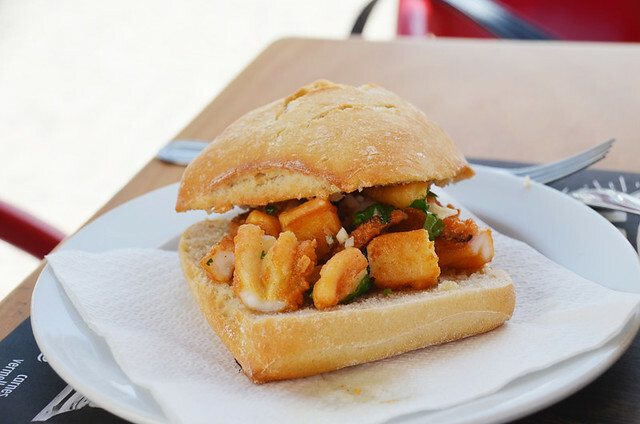 We enjoyed Lisbon’s fish sandwich so much we sought it out the next time we visited Portugal. The receptionist in our hotel in Evora didn’t have a clue what we were talking about when we asked where we could find them (a request which was lost in translation as I think we called them fish pregos) but we found it easily. 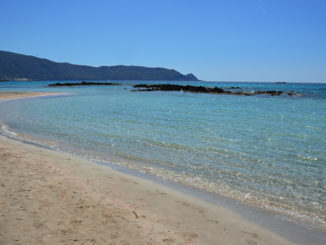 However, at the next stop, the riverside restaurants of Alcácer do Sal, we lucked out. A waitress suggested we tried the choco frito version instead. Fried cuttlefish in a roll wasn’t something which would have normally have tempted me, although having already tried it, I knew Portugal’s choco frito was in a different league to the cuttlefish I’d eaten elsewhere. As a hot butty it worked remarkably well. This one’s more a Setúbal speciality so not so easy to find outside the region. Generally I find toasties quite dull, the preferred snack of the unadventurous eater. Not so in Portugal where toasties (tostas) are a different animal altogether. We discovered this during post-walk lunch in Alentejo, in a cafe overlooking a fluvial (swimming pool in a river) in the border town of Portagem. 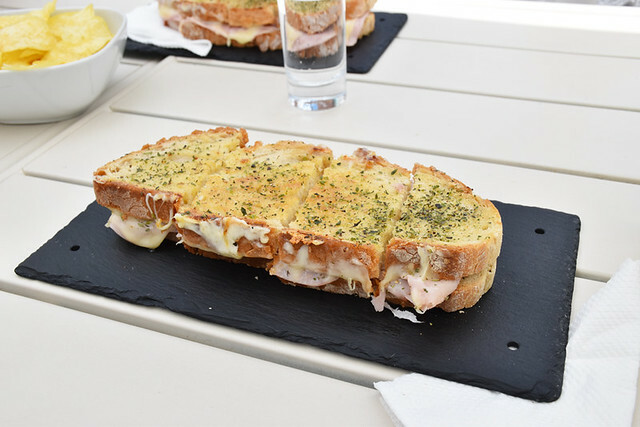 For a start it was huge – a double decker of cheese and ham in chunky bread. Secondly it was tarted up with the addition of herbs sprinkled over the bread. Thirdly, extra flavour came from it being drizzled with (or maybe fried in) olive oil. It was a game changer. Now we only order one between us as one each often defeats. I think, but I’m not sure as I’ve munched a lot since, I first tried these in a shopping centre on the outskirts of Setúbal. Incidentally, shopping centres in Portugal tend to have a far more interesting choice of places to eat than shopping centres in the UK (less homogeneous). 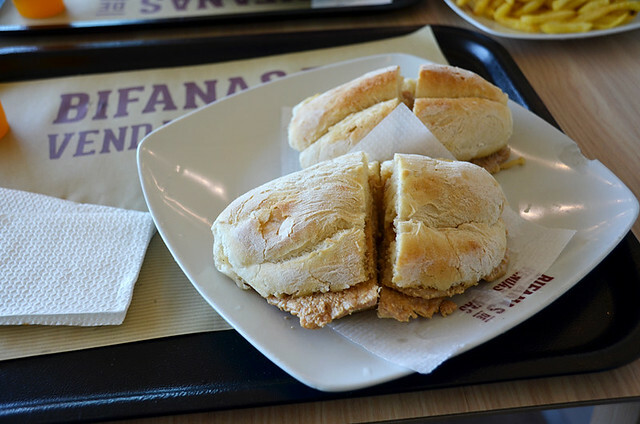 Bifana’s originated in Vendas Novas, a town near Lisbon. They’re like the pork version of the prego… but tastier. I prefer their spicy pork flavour, it reminds me of Spain’s pinchos morunos. When I get a yen for something hot and meaty in a roll, bifanas are my go to snack. I first ate alheira, the Portuguese sausage that isn’t a sausage, in Guimarães. In all honesty, it’s not a looker when seen presented on a plate. But I like its gamey flavour, so tend to have it when it turns in a format which doesn’t look as though it’s something which has been purchased in a joke shop (do these still exist?). 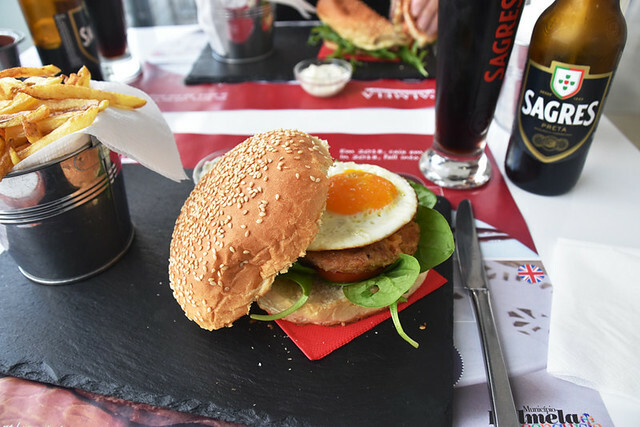 Most recently this was as a burger in a restaurant below the Moorish castle in Palmela and came served with skinny chips and a Sagres Preta. If you’re going to try alheira I really recommend trying it as a burger. With a fried egg on top it was exceptionally good. Leitão (suckling pig) sandwiches are popular in various areas of Portugal, as is porco preto (black pig). Both are trumped whenever I spot anything with wild boar (javali) on a menu. As javali is relatively common in Portugal, this happens quite a lot. 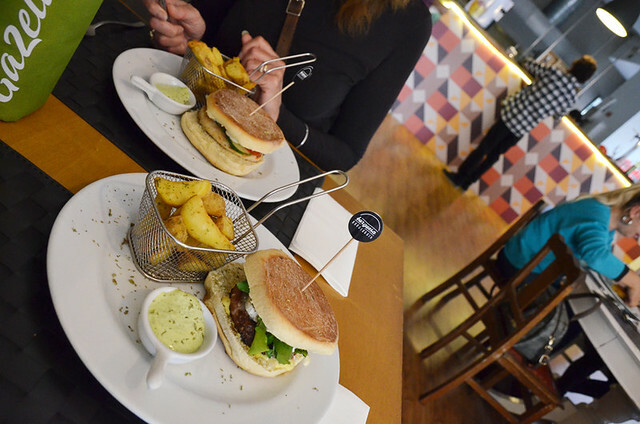 Pictured is a wild boar burger in a place called Burger & Gin in Setúbal. I’m not sure one goes with the other, but a gin after a speciality burger works for me. I’m a sucker for food stalls at fairs, especially ones selling hot things in bread. One named Rei da Fogaça (King of Bread) at a Medieval fair in Castelo de Vide reeled me in like an angler catching a fish. Signs saying their pao com chouriço had been cooked in oven using handcrafted wood (I’m not sure what that means when I stop to think about it) had me queuing up to buy some chorizo bread. It’s a popular snack in Portugal, but maybe a bit too much bread and not enough chouriço for my tastes. Finally, the biggest surprise of the bunch – salted cod in bolo de caco, a speciality roll from Madeira. Bolo de caco I knew and loved anyway, but I have an up and down relationship with salt cod, both in Spain and in Portugal. 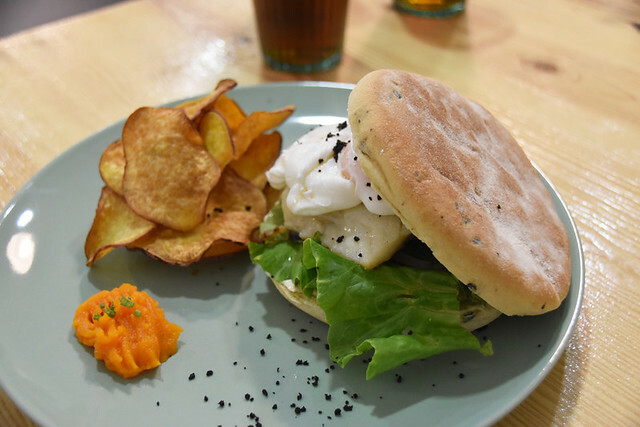 The Breakfast Club is a rare beast in Setúbal, a place where you can get a breakfast which involves more than coffee with a pastry. Its brunch menu drew us in when we we were showing a friend the wonderful Maria Pó shop opposite. I was about to order their salmon burger when I veered off course during ordering and opted for a salt cod burger instead. Often bacalhau disappoints, but sometimes it delights. 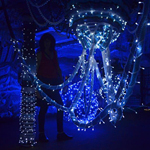 In this case it wowed me. A runny poached egg topping adding to the dizzying combination of flavours had me boring my brunch companions by going on and on about just how good it was. 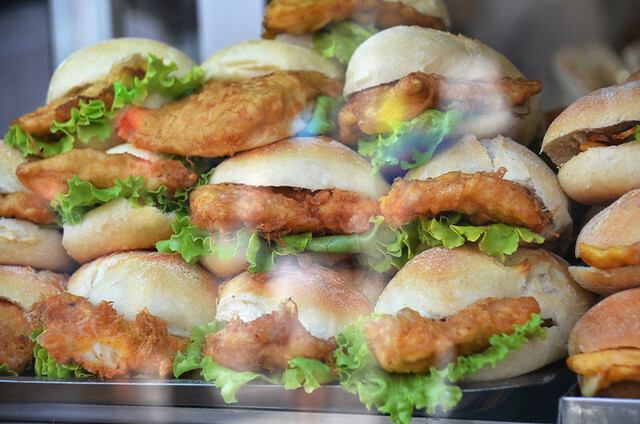 The bacalhau bun was the latest hot Portuguese snack to get the taste-buds shouting encore. 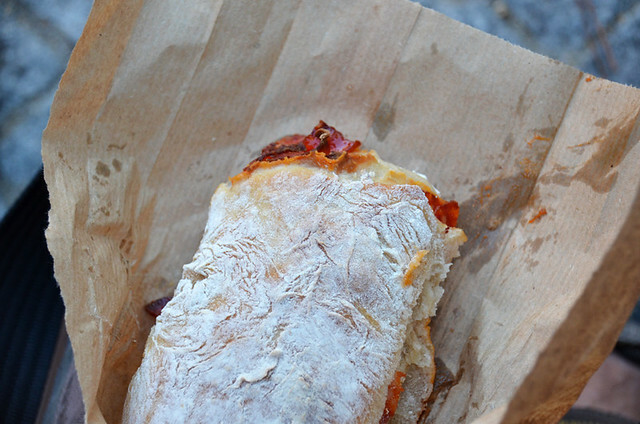 But discovering hot sandwiches seems to be something of an ongoing process in Portugal.